Southampton boasts the largest number of purpose built vaults in the whole of Britain. Most started out as wine vaults, some dating back as far as the 12th Century. Several are very similar to those in Bordeaux, where the earliest wine imports came from. It’s just possible that the Southampton merchants copied standard French wine cellars, and may even have brought French masons over to Southampton to build them. This walk takes you to several varied vaults, some at ground level and others quite deep underground. 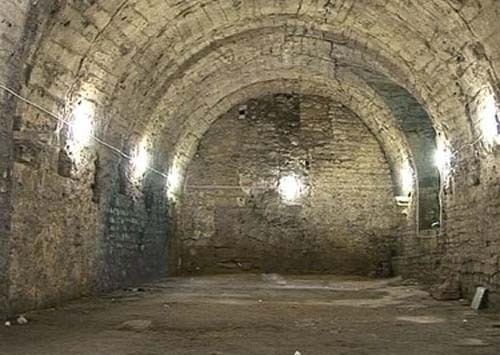 Some vaults that started out as straightforward wine cellars were destined, through the centuries, to become medieval shopping outlets, tradesmen’s workshops, safe storage for precious items, coal cellars and finally World War 2 air- raid shelters. There’s one that might even have started out as a town dungeon! Unfortunately, this particular walk is unsuitable for people with walking difficulties and those prone to claustrophobia or related conditions. For booking, or more information about this walk, please use the Contact Form at the bottom of the Themed Walks / Tours page.